I work with a small firm called >X that helps organizations define new market opportunities. We do this by deepening their understanding of the people they serve or wish to serve as customers. We use this understanding to solve the problems those people care about most. On more occasions than I can count, I’ve found myself stuck between a rock and a hard place. The metrics business stakeholders care about, the numbers that drive remuneration, and the way organizations define success is regularly at odds with the metrics their customers care about. I wrote about this in a previous article and proposed that outdated business models, or metrics, drove design and implementation behaviors that are counter-productive. Products and services should augment human capability. Instead, they’re locking people in. This isn’t a hard and fast rule—there’s black, white, grey, and everything in between, yet our observations have become clear. Business metrics don’t align to customer metrics. We believe they should. This article will describe what we’ve learned in our search for metrics that speak to both business stakeholders and the people they serve as customers. Rather than giving you practical advice, this content is designed to spark conversation. We trust these conversations help us progress our thinking and further develop this new model for something that resembles the greater good. I constantly find myself synthesizing in real time. I can’t seem to help it—it just happens. Because of this, any new data point can spark a reaction. About 12 months ago this happened. It wasn’t particularly unusual given what I do for work, but all of a sudden I was immediately obsessed with why there wasn’t a working definition for what made for a great experience. Sure this is subjective, but my brain didn’t seem to care. I started thinking more and more about this. It didn’t go away. I started diving deeper into research on value dimensions, motivational psychology, and neuroscience. I learned a lot. These 3 things are what we cared about most. 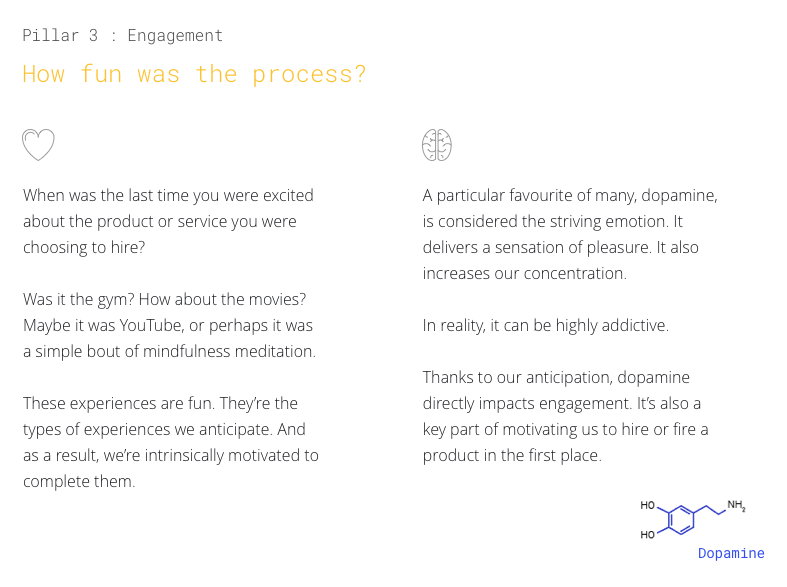 For an experience to be truly great, it had to satisfy value, meaning, and engagement criteria. It seemed to roll off the tongue nicely too. But we had to put it to the test—this was less than a quarter-baked theory at best. We started conducting some early experiments as part of our work. We began finding ways to qualify and eventually quantify value, meaning, and engagement. This was the start of our effort to make business and customer metrics one in the same. We ideally wanted to find a way for genuine customer metrics—those articulated by the real people an organization serves as customers—to impact the way products, services, and experiences were designed by the organizations we work with. Since those early thoughts, the model has progressed. I’d like to introduce you to it in the hope it resonates. Perhaps you’ll find a way to optimize it, contextualize it, and use it to generate demonstrable value, meaning, and engagement for the people you serve as customers. Here’s a high-level view of how we now think about each pillar. 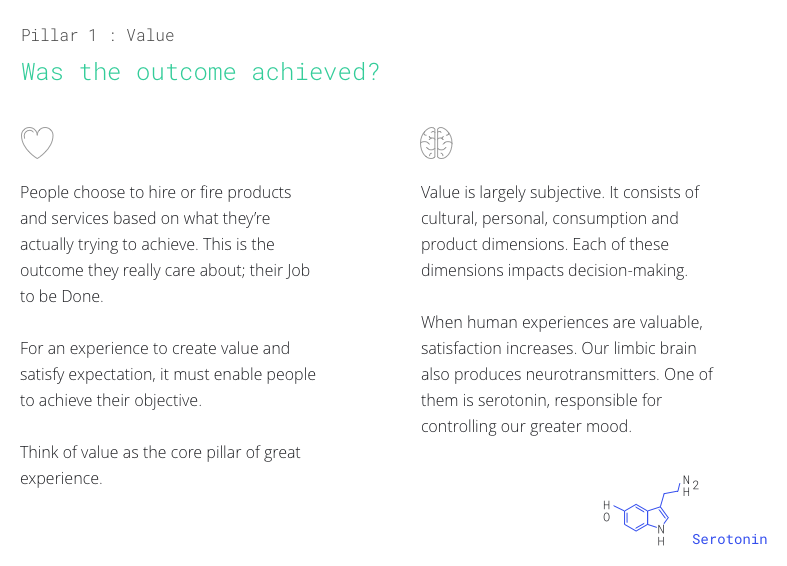 People tend to define value in terms of how effectively a given product or service helped them achieve their objective. As an example, let’s say you’re finishing up work late. You haven’t eaten in hours and you’re feeling really, really drained. You’ve also got specific dietary requirements: you want food to be delivered to your home in 30 minutes. A food delivery app that delivers food you can safely eat, on time, and at an appropriate cost, is going to fulfil your objective. The outcome this experience enables is valuable. When thinking about how to understand and eventually design for customer value, we use the Job to be Done method. This helps us understand the things people are motivated to achieve. It provides insights into opportunities to improve the job execution process, and it enables us to step back, take some time, and actually find better ways to help people get stuff done. It can also be helpful to map this to a higher level view like the elements of value pyramid. People tend to define meaning based on the relative priority a given “thing” has in their life. As an example, catching a ride to the airport may seem like a fairly mundane task. But what if you’re running late, and you need to catch a specific flight to witness the birth of your first daughter? In this situational context, the relative priority of catching a ride is as high as it gets. It’s the most important thing in your life right now. The outcome this experience enables is meaningful. 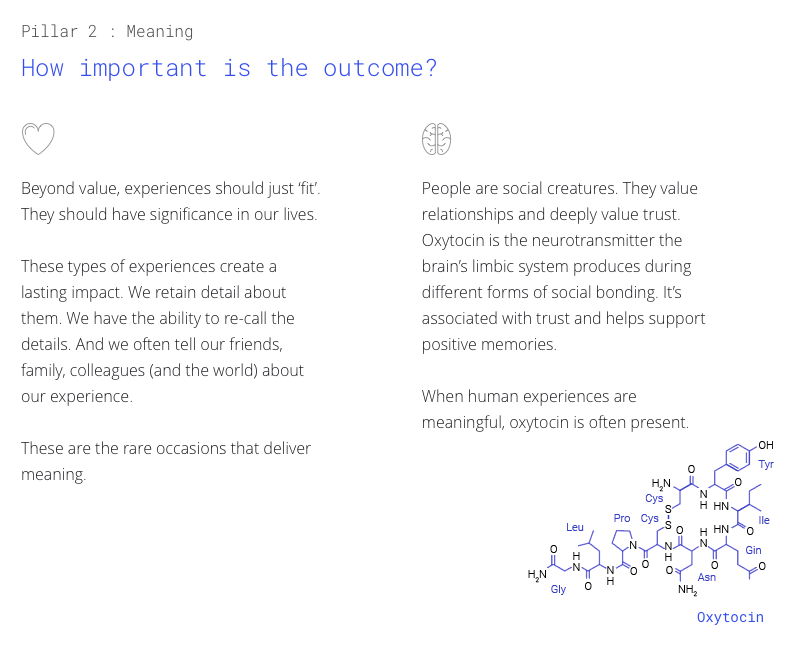 When thinking about how to understand and eventually design for meaning, we again make use of the Job to be Done method. Specifically we look at importance versus satisfaction and situational context. This gives us a clear view of the relative priority people place on a job. It also helps us understand how different situations drive the fluidity of this largely subjective measure. We’ve also found measures, such as Fjord’s Love Index, to be helpful. This pillar might be the easiest—and it’s all about fun. Sometimes fun is why you actually hire a product or service. Fun is the value you seek. Yet in a different circumstance, fun may not be appropriate. So in fact, this isn’t easy. Let’s say you’re moving overseas. You want to learn the language to make your stay more fulfilling. This is a daunting task, and your motivation may vary. Yet the app you’re using has personality. Everything is a little tongue in cheek. The humor and notifications hit you at just the right time and make the experience fun. And as a result you learn more, faster. The process of achieving the outcome is engaging. When thinking about how to understand and eventually design for engagement, we use the Job to be Done method as our foundation. This sets the context for what type of engagement we should be designing for. Hint: it has to be appropriate to the job. From there, we push for specific measures that align to the context of use. If it’s transactional in nature, we may design for small moments of delight, but our goal is to execute the transaction and outcome quickly and seamlessly. In cases like this, zero friction is just as good as engagement if not better. A lack of engagement is actually what we seek. In other cases, making use of specific models such as Nicole Lazzario’s 4 Keys 2 Fun or Yu-Kai Chou’s Octalysis will enable us to design for engagement appropriately. So that’s a basic introduction to how we think about these measures. Putting them into action is a different story altogether. In really simple terms, after we’ve gotten close to our customer, we use contextual inquiry to give us foundation VME measures. We attain these measures by first working with research participants to define what value, meaning, and engagement means to them in context. They’re then asked to give a score from 0–10 for the value, meaning, and engagement of a given product or service experience—the thing they’re currently hiring to get their job done. We then average these scores out across the research group to establish a baseline. From this point forward, we conduct design experiments to determine which variables most positively impact each of the 3 measures. Once we’ve established this baseline and started making use of these metrics, we need to figure out how to scale. We need to find ways to associate quantitative measures—those readily available to us, without impeding on people’s privacy, with each of the 3 pillars. If we do this, we’re able to make use of 3-pillar design, or VME Metrics, across the functions of a customer-facing business unit or product organization. To be utterly transparent, this is the piece of the puzzle we’re currently working through. We’re doing this project by project. We can consistently execute high-value research that produces unique insights at low scale (10–30 customers), or scale this up with sound surveying methods, but this isn’t the bigger picture. We’re motivated to embed value, meaning, and engagement into product ideation, design, and implementation. And that’s where you and the other smart people around you come in. Our vision is for a world where business and customer metrics aren’t at odds. It’s a world in which organizations consciously design products and services that maximize value, meaning, and engagement in the lives of the people they serve as customers. In this world, these organizations are rewarded for this effort. The greater value, meaning, and engagement they deliver, the more successful they become, and the greater gap between them and the competition. This is where I’ll leave you. I hope this content encourages new thinking. You may want to challenge our approach. Please do. Only through these types of interactions can we work towards bettering the model. You may want to find out more about the specifics. Get in touch if that’s the case. If we better the model together, then we will commercially validate it at scale. If we do that, we might find ourselves in a future something like the one I described. That’s what we’d like to see. Let’s go make it happen. Did you miss Nathan’s recent InVision DesignTalk on the new rules of designing with data? Check it out here. I'm the founding partner of >X , a research, design and strategy agency at the forefront of the personal data economy.